A big blow for the Opals, the Canberra Capitals, and the Seattle Storm. 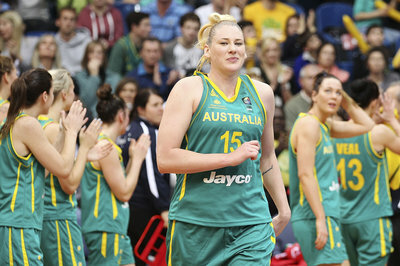 The Australian women’s national team will have a blow to their roster, as center Lauren Jackson will miss the 2014 FIBA World Championships for Women in Turkey. This is due to an ongoing knee rehabilitation, per Jon Tuxworth of the Canberra Times. I truly feel for [Jackson] right now, I know what it means to her to represent Australia and I’ve seen how hard she’s worked through training and rehab to get herself fighting fit for these world championships in Turkey. As a team, we’re obviously disappointed not to have her with us for the world championship campaign, but her health is top priority and we’re all fully supportive of that. I’ve worked so hard on my rehab program and my knee injury has actually progressed well – sadly, just not enough to compete at Worlds. Put simply, we just ran out of time. Further, a problem with my hip has continued to worsen and it’s now impacting on my rehab program. After scans this week the medical advice was to operate today. I’ll be back with the great, supportive team at the AIS in just 2 weeks and preparing to play for the University of Canberra Capitals in November. The superstar center has had injury issues which have limited her ability to play in recent seasons. She already has missed both the 2013 and 2014 WNBA seasons with the Seattle Storm. And though this news is just about a longer-than-expected knee rehab, it also may complicate things for the Storm, assuming that the organization is banking on her return in 2015, where she would get to reunite with Sue Bird and also alongside the #1 overall pick in the 2015 Draft. Heres to hoping that Jackson can come back healthy since we definitely want to see her play in the WNBA again.